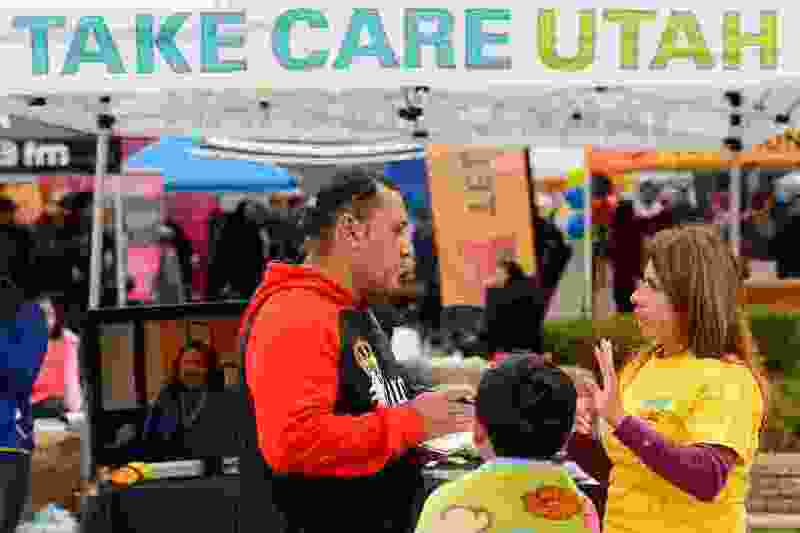 (Trent Nelson | Tribune file photo) Julie Contreras, one of Take Care Utah’s team of enrollment assisters, offers help and advice about applying for health insurance with attendees at the Hispanic Heritage Parade in Salt Lake City, Saturday September 23, 2017. Fewer Utahns signed up for Affordable Care Act insurance through healthcare.gov this year, joining their peers nationally in an enrollment dip that follows a repeal of the tax penalty for those without insurance, known as the individual mandate. Preliminary figures released Wednesday by the Centers for Medicare and Medicaid Services, or CMS, showed 194,813 Utahns enrolling in the marketplace through healthcare.gov, a decrease of roughly 300 compared to 2017. Those plans are used primarily by people who do not get their insurance through an employer. Randall Serr, Director of Take Care Utah, said the enrollment count may increase in the final numbers, but will likely remain at or below the 2017 level. This year’s open enrollment period was the first since Republican lawmakers in Washington voted to repeal the Affordable Care Act’s individual mandate late last year. That repeal — tucked into the GOP’s Tax Cuts and Jobs Act — takes effect in January and ends the tax penalty for Americans who go without insurance. The vote on the Tax Cuts and Jobs Act followed multiple attempts to repeal the Affordable Care Act — more commonly known as Obamacare — including an effort that failed by a single vote in the Senate in July. And several states, including Utah, filed a lawsuit challenging the Affordable Care Act, leading to a ruling last week by a federal judge in Texas that struck down the health care law as unconstitutional. The judge’s ruling is currently on hold pending a likely appeal by a separate coalition of states. Nationwide, Obamacare sign-ups fell from 8.8 million in 2017 to 8.5 million this year, a change that CMS administrators described as “steady” in prepared statements released Wednesday. “With the lowest unemployment rate in 50 years, it’s possible that more Americans have employer based coverage, and don’t need exchange plan,” said CMS Administrator Seema Verma. CMS also reported that a surge in health insurance sign ups during the final days of the open enrollment deadline could lead to some plan enrollments not yet being included in the preliminary numbers released this week.